Polls may be open somewhere, results in many races remain inconclusive, but I am willing to make one fearless projection: ABC News is the winner in 2012's Election Night coverage. In fact, ABC's coverage of the entire campaign has generally left competitors red in the face if not green with envy, though that hardly means it was without its own fumbles, stumbles and wretched excesses. On election night, though, ABC's George Stephanopoulos truly ascended to the very first rank of TV anchors, the potential to be the Walter Cronkite of the twenty-teens. He co-chaired the event with the indefatigable if sometimes overly thrilled Diane Sawyer, whose energy is awe-inspiring, though there sometimes seems to be way too much air around her words and coming out of her ears. Stephanopoulos, who carries perhaps too heavy a work-load at ABC (he co-anchors "Good Morning, America" and hosts Sunday's "This Week" series), brings heart and spirit as well as tremendous smarts to the task of political coverage, and if he's sometimes a trifle wonky, Sawyer is there to humanize him and the coverage. On Election Night, they were pure gold. ABC's array of supporting talent was, as always, auspicious: Its gallery of commentators on Election Night included Katie Couric, George F. Will, Donna Brazile, Matthew Dowd, and Nicolle Wallace. Most of them seated tidily side-by-side, an arrangement that may have reminded veteran viewers of the old "Quiz Kids" show from TV's stone age, they nonetheless had valuable and spirited insights and delivered them without the filibustering that goes on along many other channels, especially the openly partisan ones like MSNBC and flaky-flukey Fox. For all that, Sawyer and Stephanopoulos and ABC News producers showed they lacked class by being very disrespectful to Barbara Walters, one of the great founding superstars of network news. Walters was seated at the far right end of the big wide desk and didn't get to make a major comment on the election until 7:45 Eastern time, more than an hour after Sawyer signed on with "World News" (which then continued into coverage). Barbara Walters, still a powerhouse with her "The View" and her occasional specials, deserves far better treatment than she got from ABC. As usual on election night, there was almost nothing to report for the first couple of hours, but ABC managed to make it fairly compelling viewing anyway. The network enjoyed a huge visual advantage: Times Square, which all lit up at night made a spectacular sight, expertly exploited by ABC's cameras and correspondents stationed at street level to ask person-on-the-street questions. So what if many of the persons made stupid remarks? You take your chances with things like that, and the chances remain worth taking. After all, a steady parade of experts and pundits and statisticians can be wooze-inducing. Sawyer and Stephanopoulos kept the tone brisk and, when necessary, even fun. Frankly I did not keep track of who called which state when, as I did for years as a TV critic, because in the long run, everybody has the same information (what's news is when somebody screws up hugely). I was looking for who made the most of the show when there wasn't that much to report. Diane and George came through repeatedly. They actually got some laughter and human vulnerability out of omnipresent presidential advisor David Axelrod, who was teased about an alleged pledge to shave off his mustache if Barack Obama lost Pennsylvania. Axelrod vowed the mustache would still be there when snow falls (which could be any minute in The New East, of course). CNN's coverage was adroit, mostly no-nonsense stuff, with Wolf Blitzer, looking very much like Richard Attenborough as the codgerly entrepreneur of "Jurassic Park," coming across as a little less ponderous and pompous than in elections past. With touch-screen gizmos now commonplace on most networks, it does seem a little silly for Blitzer to refer to CNN's big screen as "The Magic Wall." But as hype goes, that was far less irritating than the incessant drum-beat of ABC's "Your Voice, Your Vote" theme for the whole election year. Good grief, are they going to keep that up through Inauguration Day? It reflects the network's over-zealous mania for self-promotion. ABC is owned by Disney, we must remember, so there is a tendency, however subtle, to Disneyfy even democracy. Maybe ABCs graphics are a trifle too cartoony as a result. Techno-gimmickry is so commonplace now that few viewers are likely to be wow'd by any of it, though some of us still are cheered when the fancy-shmancy gizmos don't work. One thinks back to the iconic image of the late Tim Russert holding up his hand-scrawled "Florida" sign on an Election Night of long ago -- no electronic toys needed. Things we definitely won't miss once the election is finalized? Well, almost all of the political commercials, of course, although the PrObama one starring the man who lost his job when Mitt Romney and Bain Capital closed down the paper factory where he worked -- that one was effective every time, perhaps because the man -- whether real or an actor -- was so effectively heartbreaking. He and coworkers, he said, had to build a makeshift stage from which Bain executives made the announcement that they were all out of work. He said it was like building his own coffin. Very strong stuff. On the other hand, Republican ads calling the President of the United States a "failure" rubbed me, and I assume many others, the wrong way, and would have even if I felt kindly toward the candidate who said he "approved" them. I wouldn't have even liked to hear either of the George Bushes called a "failure" in political advertising. Come to think of it, Nixon wasn't even really a failure. A crook, but not quite a failure. He sure kept us entertained. For those of us who grew up with television, this Election Night was lacking one much-loved component of earlier times: Dan Rather. Yes, I know, many people found him irritating, some kept accusing him of being some sort of sneaky "liberal" propagandist (he is, whatever his politics, one of the most passionately patriotic individuals I have ever known), and he met an unhappy fate at the hands of CBS Inc. and its creepy executives. But for all that, Dan on Election Night was always poetry in motion, and what motion. And what poetry -- those folksy fractured "Ratherisms" that always seasoned his commentary. As a matter of fact, Election Day 2012 wasn't entirely without them. 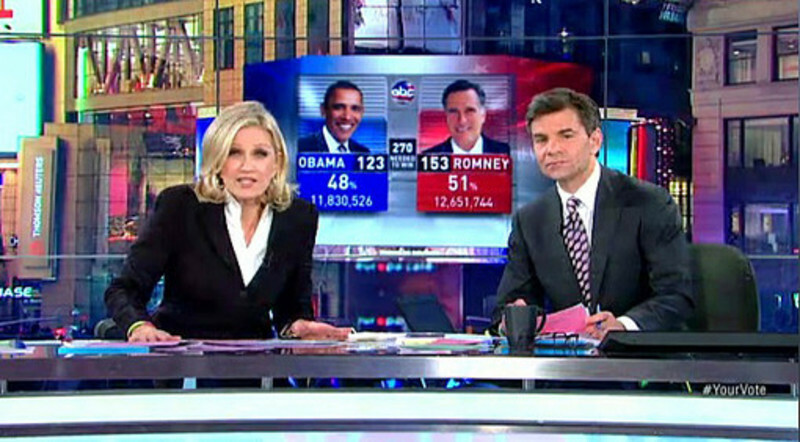 Dan appeared very early in the day on cable's popular "Morning Joe" show where, when asked, he predicted a very, very close election. Whoever won, he said, the margin of victory would be "as thin as turnip soup." Way to go, Dan! Almost like the old days. As for CBS today, I didn't even feel the urge to watch more than a few minutes of it. Talk about Jurassic Park! CBS News now (with the obvious glorious exception of "60 Minutes") seems colorless and dry, and it certainly can no longer boast the brightest roster of correspondents in all of broadcasting. Far, far from it, sad to say. It's a roster about as watchable as an overturned turtle.